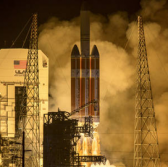 A solar probe that Johns Hopkins University Applied Physics Laboratory designed and produced for NASA took off Sunday aboard United Launch Alliance’s Delta IV Heavy rocket from Cape Canaveral Air Force Station in Florida. The Parker Solar Probe will deploy its magnetometer boom and high-gain antenna in the mission’s first week and kick off in September the instrument testing phase that will continue for approximately one month, NASA said Sunday. The spacecraft, named for physicist Eugene Parker, is expected to reach Venus to carry out gravity assist operation in October and send scientific observations by December. NASA expects the solar probe, which is designed to help researchers improve space weather event predictions and explore the sun’s corona, to perform 24 passes by the sun and six additional Venus flybys during its seven-year mission. The car-sized spacecraft is part of the space agency’s Living with a Star program and has four suites of instruments that will work to collect solar wind images and investigate energetic particles, plasma and magnetic fields. Those investigations will be led by the Naval Research Laboratory; University of California, Berkeley; Princeton University; and the University of Michigan, Ann Arbor.